I need a bottom panel or some intuitive way to see what programs are open. I could have a bank account open and not know it. I’d like to recommend Xubuntu instead of Ubuntu. The XFCE desktop is very similar to the classic Gnome desktop, and much more usable and configurable than Unity. You get panels — more than one, if you want. The whole thing is very configurable, and since Xubuntu is an official Ubuntu project, you get all the benefit from the Ubuntu backend development. Unity is terrible. I wouldn’t use Linux at all, especially not Unity, if it weren’t for some Android development I need to do that can’t be done on Windows. At least I can reduce the nightmare of Unity. I agree unity is terrible but there is option to disable it which is great. I personally think linux is better then windows in many aspects. Especial being a software developer you will quickly discover as you get used to it.. Installing gnome-panel alone doesn’t solve the issues with unity. For example you still cannot have notifier icons on the top bar for e.g. skype and cannot add easily another applet to the same bar (e.g. system monitor). You cannot modify the them of the window and move the buttons on the top right corner for example. I installed ubuntu 12.04 3 days ago and I am very disappointed with the lack of features of unity with respect to the old gnome 2 bundled in ubuntu 10.04lts. Hope they will fix all these issues soon. Xubuntu is working well for me — the Xfce desktop is very conventional, like Gnome2. If you are unhappy with Unity and if you have a spare PC, I recommend that you install Xubuntu and see for yourself. And you will be able to see programs opened. 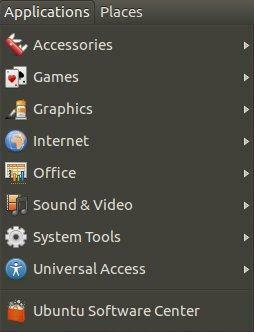 where is the System tab, from the top gnome pannel pleas? Alt + Tab to switch between applications does not seem to work. Any ideas how to fix this? You will find Administration and Preferences here. This worked a treat, thanks. My Ubuntu laptop (HP 550) is pretty old, but I didn’t expect the performance improvements me to be quite so impressive when I switched back to good old plain Gnome… it’s like going back to XP after Vista. and one thing is that it not work first .. its an 11.04 version .. then fisrt type sudo apt-get update and after run the command given ( sudo apt-get install gnome-panel ) then work .. It would help if you told ‘victims’ of the weird 12.04 desktop how to open the terminal, since there are no icons or menus visible when i upgraded to 12.04. And now I couldn’t go beyond this point as I was worried that the system is going down and couldn’t continue my works. Any suggestions would be appreciate. Thanks. XFCE is okay but I cannot stand the mouse icon etc. Ubuntu should top using unity. It is horrible. I like classic UNIX desktop. VMWare’s Unity does not work with the default Unity of Ubuntu’s 12.04.. And so, I had to fall back to GNOME2 for several reasons (not just VMWare Unity). Unity is somewhat annoying. With GNOME 2 (Classing Gnome) applications and folders can be sorted and accessed through a simpler interface. It’s very easy.